According to the Apostle Mark, immediately before this, Jesus had admonished, again, his disciples for their refusal to believe those who had seen him after the crucifixion. In Acts, Luke has told us that they asked if Jesus was going to restore the kingdom to Israel, and Jesus tells them it’s none of their business to know when these things are going to happen. Well! What is a person to do? It seems they can’t win with their friend who criticizes them at almost every turn. Some commentators have suggested that the rest of today’s Gospel was added later to soften the harshness that was apparently spoken by Jesus to the disciples. Certainly, this time, after the Resurrection, must have been extremely trying for these simple disciples. They were to take everything on faith, yet they had not been given the grace to rely on faith. That was to come. So again, what is a person to do? Aren’t there lots of mixed messages here? Don’t we face mixed messages ourselves every day, much less in our own bibles? Without going into Bible Exegesis, let me just say that what we have been given is an amalgam of many writers, persuasions, and missions, all to explain what happened when a rabbi in Roman times in Israel lived and taught among his people. Yes, there are contradictions, even some harsh words, but there is one concept that Jesus is reported as having promulgated eleven times: Love one another. So, in today’s readings, we find many different points of view, admonitions, desires, all of which can be encompassed by the two events celebrated today, the Ascension, and next week, Pentecost. Remember, they were not yet possessed of the Holy Spirit as promised by Jesus. And they were losing their teacher, friend, and master. How could they not have been anxious and confused? We today, must remember the one commandment that Jesus gave us time and again: Love one another. Listen to the readings and Gospel stories throughout the year. All can be encompassed in that new commandment. And the Apostles reported this time and again. The early followers of Jesus loved one another, took care of each other, and showed the world they were Christians by their acts of charity and sacrifice. Throughout the Bible we are given these little moments of hope, of promise. 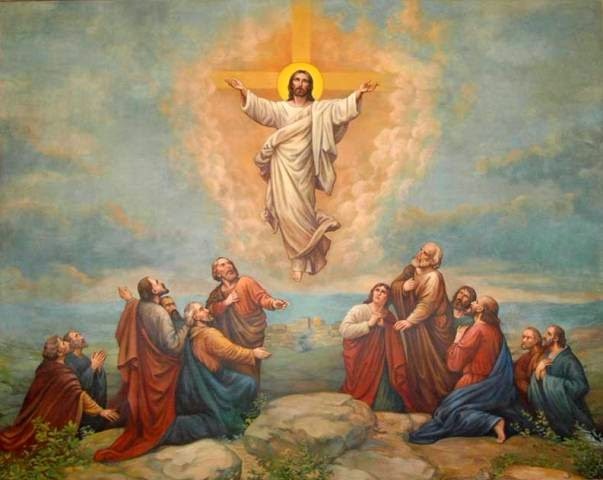 Today, the Feast of the Ascension, we can feel the loss the disciples felt. When I was a child, I always felt bereft on this day, losing Jesus. I could empathize with those disciples and felt their anguish. Well, you know, we’ve heard over and over: “When one door closes, a window is opened.” That’s what the love Jesus taught us is about too. We are never really alone. All we have to do is remember the new commandment: Love one another. Like the Apostles, if we are fulfilling our mission as Christians, the very act of seeking out those who need our love opens many, many windows for us. Lord, today give us the peace we seek, and the comfort of your promises, and show us the way to love one another.